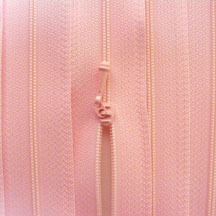 It's our baby pink zipper! 12" long and perfect for small sewing. Use this size for bigger projects or cut up the zipper and make smaller custom sized ones. Extra sliders are available under "Zipper Pulls". 1 zipper per package.